Cultus Lake Provincial Park is 656 hectares of evenly divided parkland on the northwest and southeast sides of its namesake lake. Cultus is a derivative of the Salish word kul meaning bad or worthless. 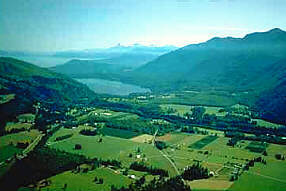 The park is 13 km south of Chilliwack. Turn off of the Trans Canada Highway on to access roads to the parks entrance. Camping - Four campgrounds with water, toilets, showers and firewood are located throughout the park: Clear Creek (80 sites), Delta Grove (58 sites), Entrance Bay (52 sites) and Maple Bay (106 sites). A group camping area is also available. Picnic areas, a sani-station and change houses are provided. Fishing and Boating - Boat launching ramps are located on the southeast side of the park. Anglers may try their luck for rainbow and cutthroat trout and Dolly Varden. The Vedder River is noted for its large steelhead, whitefish and coho salmon population. Hiking and Trails - Trails of varying length and difficulty lead to the parks scenic features. A park interpreter is available from June to August.